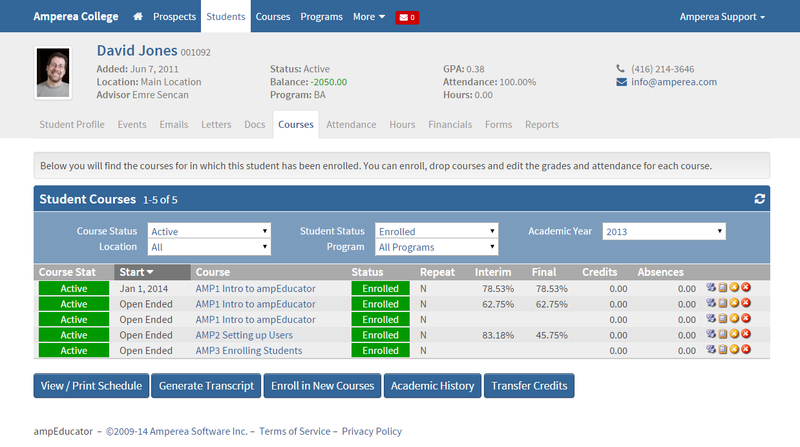 When you click on any Prospect, Student or Course name you will notice a new Summary Card of information at the top of the profile. This information is always displayed no matter what tab you have selected. This is to help reference the profile you are currently looking at without having to click back to the main Student profile tab. You will notice changes to the main menu user interface in ampEducator. The entire menu system has been converted to BootStrap which allows you to access the menu system and have it fit on any device. Calendar and Documents as well as the 'Gear' icon (Configuration) have been moved to the More... tab in order to make more space available. Emails have been replaced with an icon as well. you can compare the old and the new below.